3.1 What is Hidden Asthma? 4 What Asthma In Toddlers Is? 9 Three Natural Cures Your Kids Want You To Know! 10 What are the Common Asthma Symptoms in Children? Asthma is the most common respiratory disorder among the children than any other chronic disorder. According to certain studies it shows that 8.5% of the total population of children is affected with Asthma in US alone. So the severity of the occurrence of Asthma could be understood well enough from these stats alone. According to recent studies Asthma is also caused by allergy conditions including eczema (atopic dermatitis), hay fever (allergic rhinitis) and even food allergies. So, Asthma in children is a very important matter of discussion in the e-medical field to help you with a lot of valid information that could help you to manage the Asthma in your children. The allergy which leads to asthma in children occurs in three stages. Sometimes child may start showing symptoms of asthma in the initial stage itself. Atopic dermatitis: – This is the first stage of allergy in children which starts to show at the age of two. In this first stage, child will be affected by rashes and itching in hands and legs. Allergic rhinitis: – This is the second stage which starts when child is about eight years old. The most common symptoms that you need to check out in your children at this stage are: coughing, wheezing, cold, itching nose etc. If not given proper medical attention, child will soon start showing symptoms of asthma which is the third stage. Coughing, may occur as the only symptom in some cases on such context it’s termed as cough-variant Asthma. In the case of wheezing, it’s a high pitched whistling sound produced by turbulent airflow through narrowed airways. The other symptoms you should take care of are difficulty in breathing, chest tightness, and poor exercise endurance. The real reasons for the wide occurrence of Asthma in children are not known exactly. But the studies conducted through years say that, many risk factors are present in our environment as well as in our life style including food and other substances that comes into contact with you in the environment. The most possible risk factors that are noted and you need to have a better knowledge about it are: Asthma in children is diagnosed typically by clinical methods. When your child is facing constant problems with breathing like coughing and wheezing you need to consult a doctor. Since coughing and wheezing could be a symptom to other infections like flu and common cold we need to confirm the occurrence of Asthma in your child with more precise clinical test. 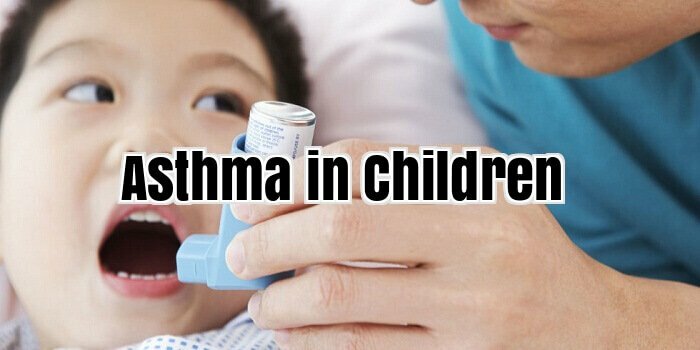 The most common way or the primary method done is that when your child is having symptoms like coughing and wheezing constantly the doctor prescribe the medicine for Asthma if the child is responding to that with time then we could a primary confirmation that there is a serious chance for your child to have Asthma. Once such a response is observed you are advised to do more precise clinical test for your child as directed by the doctor to confirm the occurrence of Asthma in your child. Some of the confirmation test for Asthma that are generally conducted are: exhaled nitric oxide (FeNo), which helps to find out the inflammation in the airways, other test conducted is impulse oscillometery is used to measure the resistance in the airways. But in the children below the age of 5 such test are done only if no other options are available unless doctors more depend upon the history of the family in relation to the occurrence of Asthma in their family. Asthma in children is caused by many agents who are allergic in nature commonly called as the trigger factors of Asthma. Keep allergens away: The main trigger for Asthma in children is: allergens which are substances that cause Asthma in children they include mol, pollen grains, animals etc. In the case of animals the dander produced from the skin of pets like cat and dogs is a strong trigger to Asthma. Never allow anyone to smoke in home: The next one is irritants they include cigarette smoke, air pollution. Always keep children’s bedroom free from dust. If possible, never allow pets to mingle with child affected by asthma. Reduce usage of air fresheners, agarbattis etc at home. Never give toys which are made of soft hair like substances. Weather is an important one in the category like cold air, changes in weather. Exercise also cause trigger: Asthma endurance to exercise comes into act when over workouts are done. It causes breathing problem as a part of Asthma in your children. Exercise in meaning any kind of extra energy burning act could trigger the Asthma in your child if he or she is already prone to it. So extra care need to be taken on such cases. Infections also trigger Asthma in your child like flu, common cold etc. When Asthma symptoms become worsts than usual it’s called Asthma attack. Similar to adults, using inhaler is most safe medication for Asthma in children. If we can control Asthma using inhaler, then child can have a normal life like others. It is absolutely safe for children to use inhaler. With proper practice children can use any type of inhalers like adults. With spacer or mask, any small child can use inhalers. 2. Can child with Asthma have food like eggs, milk etc. Yes children with asthma can have foods like egg, milk. If a child have allergy to any kind of food, then such food needs to be avoided. Also intake of foods like ice cream, cold drinks need to be reduced. If proper medication is given, child with Asthma can lead life of a normal child. They can do exercise, play games etc. 4. Can we ignore small symptoms of Asthma? This is dangerous. For reducing the intake of medicines, some parents ignore small symptoms of asthma in children. This may lead to life threatening asthma. Improve immune system of children to prevent Asthma As a conclusion note, I must say that since no one really knows the specific reason for the wide occurrence of Asthma in children. So parents need to take more care for the children especially to have them spend more time in outdoor. They need to play a lot more than the current lifestyle scenario which puts the children in an indoor world exposing them to a more air pollution, dust, second hand smoke etc. Also it’s in the notice that the children are not exposed enough to childhood illness hence, wasn’t able to develop a better immune system for them. So have a more exposed outdoor life for your child to have a better immune system to make him a capable of preventing Asthma naturally and to live healthy. Asthma is a disease that causes breathe troubles, because it is affecting the tiny tubes from the lungs, called airways that are responsible for air caring. At these patients, the airways are inflamed almost every time; they are red and swollen. The asthma children attack is manifested by coughing, the sensation of tight chest, wheezing which is a whistling sound from chest, or shortens of breath. These symptoms are manifesting when the inflamed airways get in contact with a substance called “trigger”, substance that for the healthy people are inoffensive. These triggers are represented by the allergens, like pollen, animal protein, mole, and house/dust mites. There are also irritants that can trigger asthma like air pollutants, wood smoke, tobacco smoke, strong odours and sprays, such as perfumes, paint, or chemicals such as coal or talcum powder. Asthma is not an infectious disease. You cannot get asthma if one of your classmates has it. The researchers are trying to find out what is causing asthma but, still now, they can not exactly say witches are the factors that are causing difficulty in breathing. Years ago, it was believed that asthma’s are caused by emotional factors. That is not true. Among the young children under 15 years of age, asthma is the third-ranking cause of hospitalization. Also the number of children dying from asthma increased almost threefold from 93 in 1979 to 266 in 1996. Although, it is a very frequent disease, a child with asthma can do lots of things, just like everybody else. He just has to be careful to take his medication. Toddlers’ asthma life is a chronic inflammatory health condition of the bronchial airways in children below the age of three. This inflammation can cause the normal function of a small child’s airways to become swollen and can over produce mucus in the lung tissues. As a result, an asthma life sufferer can experience airway obstruction, chest tightness, coughing and wheezing. If the symptoms become severe this can also cause acute shortness of breath and low blood oxygen. Asthma in toddlers is a major concern for many parents around the globe. It is believed that over 50 percent of asthma life symptoms in toddlers and small children are due to allergies. In fact, toddler allergies are closely related to asthma life. The most common allergic pollutant in the home is the dust mite and the protein produced by their faeces. Hidden asthma life is a common enigma for many health care providers and is a common concern for parents of a child believed to have asthma life. Many times the parents of a toddler or young child with hidden asthma life symptoms are told to limit their child’s activity levels until the exact diagnosis can be made. There are thousands of airborne pollutants which can be found in the home such as pollen, mold spores, dust mites and household dust. However, it is the small (sub-micron) particles which cause the most asthma life symptoms while at home. The regular use of a HEPA vacuum and a portable HEPA air purifier in the room where the toddler or small child spends the greatest amount of their time will greatly reduce these asthma life causing pollutants. Utilizing HEPA technology in the proper manner along with the appropriate asthma life medication can minimize a child’s symptoms while at home. What Asthma In Toddlers Is? Asthma in Toddlers is very common, so common that there is probably somebody that you know that suffers from it. Asthma in Toddlers is a condition in the respiratory system that cause the smaller airways to tighten, this is what makes an asthma life suffer have a hard time breathing. The amount of time that this lasts for depends on how serious the condition is and how tight the airway axially is. It is a disease that can occur in people of all ages although it is more common to first appear as Asthma. Some lucky asthma life suffers happen to outgrow this condition. There are also some people that will live with asthma life for the rest of their life. People who have no other asthma life suffers in their family can acquire asthma life. It is a misunderstanding about asthma life, which it is passed down from generation to generation. Some symptoms that are associated with asthma life In Toddlers are cough, wheezing, tightness of the chest, shortness of breath, difficulty breathing. These are symptoms that can vary from person to person. An Asthma attack has levels of mild, moderate, and severe. A mild asthma life suffer usually has an attack when they have an upper respiratory infection. The rest of the other times they have no symptoms at all. Some moderate asthma life sufferers can have some symptoms from time to time. It might be worse early in the morning or late in the night, when they have a cold, illness, or are under stress. For Asthma suffers with severe asthma life, they have symptoms just about every day. At times they could find it difficult to even talk to people or to be involved in any physical activity. This is because of latest developments and breakthroughs made in the field of medicine. But the medication in not perfect, it may indeed be effective but some have contain chemicals that may not really benefit the body in the long run. Side effects are one of the most reasons why more and more people look for alternative and natural means to achieve relief from asthma life. When looking for natural relief there are a few things that you should keep in mind to avoid unwanted or unexpected results. First look into the factual background and not mere assumptions. Some natural relief treatments and medications offer nothing more than capitalized letters on a webpage claiming that they indeed work along with testimonials from supposedly thousands of people. But don’t be fooled. Try looking into the clinical trials and the scientific rationality as to why they work. Second would be on the issue of safety. Your safety must always be above all else, no matter how effective the medication might be when it has possible side effects or unknown ingredients then should even be considered. Lastly, be rational and open minded when looking. Being rational and open minded will help you avoid getting yourself into situations that you might regret and can bring you to the best possible solution you can find out there. Remember, that the main goal is to find one technique that works well for your unique condition, offering long term relief and benefits without any of the side effects. Herbs are good alternative because not only can they take care of your condition, they can also strengthen your body’s natural immune system while taking care of any underlying causes that might be present which can aggravate your asthma life further. Mullein for example was already considered a very effective and natural asthma life relief alternative even before the advent of more advanced medical technology. The component contained within mullein oil is very effective for bronchial congestion of not only asthma life but also other breathing related illnesses. Aside from its oil the leaves can also be used for helping asthma person breathing easier. Crushed dried leaves of the mullein plant can be used as a smoke inhalator when placed into a brazier or incense holder and then set on fire. The smoke acts as a mild expectorant, de-clogging mucus and bringing immediate relief. But mullein is not limited to oil and leaf alone, even the flower of the plant is used for many salves for aromatherapy carrying with it it’s the lung of adult healing properties. Give mullein oil a try if you are interested, not only is this safe but can give you immediate benefits and relief. Baby bronchitis is a result of exposure to pathogens causing the infection. These pathogens include viruses and bacteria. In order to treat baby bronchitis, the exact cause should be known first. This is by doing diagnosis in your nearest baby health centre. The tests done at the centre will let you and the doctor know the exact cause of the disease. The tests include sputum and blood tests. In extreme circumstances, a chest x-ray may be performed. Once the diagnosis is complete, medication can be started. These include bronchodilators, expectorant cough syrup and antibiotics. The antibiotics are given if the cause of the condition is bacteria pathogens. Baby bronchitis symptoms include fever, fatigue, headaches, expectorant cough, shortness of breath and wheezing. The most pronounced symptoms are coughing, shortness of breath, fever and wheezing. Immediate action should be taken when a fever is reported. Baby bronchitis should not be self treated. Bronchitis is a dangerous disease that can lead to pneumonia and asthma life. Babies with this disease should be taken care of well. This is to make them recover completely after the illness. Most babies lose a lot of weight when under bronchitis attack. Extra effort is necessary for a baby to recover from the disease. As bronchitis is contagious, babies should be kept away from family members who have the disease. Extra caution to those who handle the babies is necessary. Frequent washing of hands and general body hygiene are the keys to avoiding spreading the disease. Baby bronchitis should not be home treated. A doctor should be the one to give the medication and the dosage should be followed to the letter. Kids are a joy to any parent and it pains the parent to watch their children going through tough times which include illness. Asthma kids are very prevalent today and this is a result of the rising family history of asthma, air pollution and viral infections after birth. Asthma has no cure and therefore parents and guardians of the kids with asthma should know how to control this condition. Asthma causes in kids are almost similar with those of the adults. These include environmental pollution, mothers smoking while pregnant, viral infections and colds. The triggers can be many and the guardian or the parent should take the effort to know exactly what irritates the airways of the child. These could be the weather, animals, medication, exercise, house dust mites among many others. Once the trigger is known, controlling the condition becomes easy. Asthma kids’ activities should always be monitored. This is especially for the very young. Most of the time, it is hard to tell when an attack may over. Most of the time attacks are more frequent when the child has a cold or a viral infection. The medications should always be with the kids. Authorities in the child’s school should know of the condition and how to help the child before the parents get to her. The medication the asthma kid should take during an attack should be kept in and around their surroundings. This is according to the child’s activities. Asthma kids should not be secluded from to her kids. They should be treated as normal as possible. The good news is the asthma can disappear as the kid grows. This is if the condition is arrested early enough. Chances are you’d be in for a great disappointment as there are none that exists, at least not for the time being. Up until now, people still seem to have this misconception that asthma life can be cured. Asthma can be effectively managed and greatly controlled, but sadly a cure is just not something that we have as of the moment not even conventional medication can provide it. But if you are looking for herbal alternatives that can help you in managing and controlling the condition which can work well along with your medication, then there are a lot you can choose from. Remember though, that not everything will be effective. There are many asthma life herbal cures out in the market today but not everything has really been tested for safety and effectiveness. Common sense and meticulous research therefore is important when you are looking for herbal alternatives. Just to give you an idea as to what you might probably want to start with, here are a few herbal medications that you can use: Cayenne: Not only serving as an essential ingredient in spicy foods, cayenne has also been considered by herbalists as one of the oldest and most effective herbal alternative in asthma life treatment. The inherent compounds found in cayenne are known to boost circulation in anything that it can come into contact with. Cayenne also possesses high amounts of antioxidants which can help prevent and eliminate any underlying ailments that can make the condition worse. Chamomile: The active compounds found in chamomile have been known to have bronchodilating and expectorating effects. Preventing and alleviating asthma life symptoms, chamomile has been known as a safe and effective alternative, used by a lot of asthma sufferers in conjunction with their conventional medication. Chamomile also contains high amounts of antioxidants that can prevent any other ailments from getting in. Ginger: This down to earth (literally) cooking ingredient have also been used by a lot of herbalists in helping to eliminate and alleviate respiratory conditions, including bronchitis, coughs, colds and asthma life as well. Ginger has been known as an effective expectorant and antioxidant as well. It can be bought in several forms including dried, encapsulated, fresh and powdered. These are just a few examples of the asthma life herbal “cures” that you can count on whenever you want faster results without having to compromise safety. Check the internet for more information and you will find a lot of other herbal options that can help with your condition. Just remember to do proper research and validation first when you find one that might be effective for you. Base your decision on scientific data and solid facts instead of empty promises displayed in big bold letters named “cure”. Three Natural Cures Your Kids Want You To Know! When Hippocrates said “the physician treats but nature heals,” he was describing the human body’s natural tendency toward minimizing illness and creating optimal health. As we know, however, the body needs a little help at times. Alternative health practices can support the physical body in its natural propensity toward healing by applying very effective remedies. In this article we present powerful natural treatments for three health conditions that frequently affect children: asthma life, head lice, and pink eye. Orthodox medical doctors and the drug conglomerates won’t be overly thrilled that you know these natural treatments; they have no way of patenting or monetizing these cures. Asthma is a serious (if not frightening) disorder in which the airway becomes inflamed, resulting in wheezing, loss of breath, and tightness in the chest. About 15 million people in the U.S. suffer with asthma life and there are more than half a million hospitalizations resulting from this disorder. The prevalence of asthma life has been increasing for every age group affected. Children have the highest increase; over the last ten years the rate of asthma life in children has increased by over 90%. Parents with asthma lifetic children will know that the quickest remedy for an asthma life attack comes from medication, but there are times when a child’s inhaler is not available. There are two natural ways to treat an asthma life attack which relate to the soothing effect that warm liquid has on bronchial tubes. First, try some hot soup which can soothe the bronchial. However, the second remedy can be more effective since it includes a warm liquid with an additional ingredient: caffeine. Coffee or tea, with caffeine, can open airways similar to the way inhalers do, so try this during an asthma life episode if no medication is available. What are the Common Asthma Symptoms in Children? Asthma is a chronic disease that affects the airways in a person’s body. Doctors define asthma as being a chronic inflammatory disease of the airway that causes symptoms such as shortness of breath, tightness in the chest, coughing, and wheezing. Asthma, not only affects millions of adults around the world but nearly just as many children as well, in whom it is commonly called paediatric asthma. And so, one of the most important things that anyone with a child suffering from asthma is going to need to know is what the asthma symptoms in children are so they may be able to treat the asthma. Although, for the most part the asthma symptoms in children are basically just the same as the asthma symptoms in adults, there are some major differences that you will need to be aware of. For one, the asthma symptoms in children are often much less noticeable. For instance, your child may be playing around the park with a friend and then become quite hot and out of breath, but you may just pass it off, thinking that they are tired from running around. In many cases however, these are actually asthma symptoms in children and the child is having more trouble breathing than you may realize. The other problem is that the children really will not be able to know when they are having symptoms, and so if they are experiencing tightness in the chest or wheezing, they may not think anything of it whereas adults would recognize there is a problem. Besides recognizing these asthma symptoms in children, it is also important that you be aware of asthma treatment for children. There may not be a cure for child or any other type of asthma, but there are some very effective ways to keep it under control. After a doctor’s assessment, it may be suggested that your child start using a bronchodilator inhaler, which is one of the most commonly chosen treatments for pediatric asthma. These inhalers have really transformed asthma treatment, as they enable children and adults with asthma to be able to deliver medicine directly to their lungs anytime they need to. Of course during severe asthma attacks this may not be enough, but for general use they work very well. The metered dose inhalers are the most popular of all among doctors, and these inhalers use a chemical propellant to force a measured dose of medication out of the inhaler. They consist of a pressurized canister containing medication, a mouthpiece and as well as metering valve that dispenses just the right amount of medication. Asthma is a chronicle disease, which is characterized by the inflammation of the bronchi mucosa. It is a lifetime disease for there is no treatment to cure it completely. It can debut at any age, but the start of this disease is more frequently among children from elementary school. An inexplicable irritability, a more expressed fatigue and difficult capacity of concentration represent the early sings in childhood asthma debut. The teacher can be the first one to observe these first childhood asthma signs. After this prologue of signs the characteristic asthma symptoms appear. Wheezing is among the most common ones. A whistling sound coming from the chest represents it. Coughing is another symptom present, and also difficulty in breathing. Asthma has a very important genetic component. If one ore bought parents have asthma the possibility of children developing this disease is very high. Also the majority of children that developed asthma are known to have one or more allergies. Triggers are the ones that cause an asthma attack. The triggers represent any substances or physical exercise that cause a contraction of the bronchi muscles, determining breath difficulty. Also emotions, positive or negative can cause asthma attacks. Anxiety is very often at asthmatic children’s because of the suffocation sensation that appears during an asthma attack. Parents should be tough to remain calm an help the child by telling him to breath easily and give him the appropriate medicine. Crying is another trigger, very common in childhood asthma, because crying determine a deep rapid breathing which in turn can trigger asthma, as it does after running. Cigarette smoke is another important trigger. Parents who smoke in the presence of their asthmatic children’s can cause them an attack, because cigarette smoke, harmless for healthy persons, is a powerful irritant for asthmatics. Studies show that at children’s whose parents quit smoking the asthma symptoms improved and the crises are more rare than at children’s with parents who smoke. The most used drugs to treat asthma are the bronchodilatatores.